16/8/2018 The festival of Japanese traditional instruments will be held on 31st August, 1st and 2nd September. There will be many ensemble concerts, exhibitions, sales, a lot of workshops and free trial lessons. Teachers of trial lessons are all foreigners. You can take lessons in English, French, Spanish, Chinese, Arabic and Japanese. Please come and join us. Please refer this for detail. New! 6/17/2018 Added Photos and FAQ pages. New! My school is located at Saitama City near Tokyo, Japan. I have a Grandmaster license of Ikuta-ryu Koto and Shamisen school. 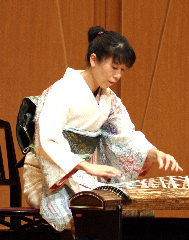 Koto and Shamisen are major traditional Japanese instruments. Please enjoy samples of my play at here. Lessons in English are available in my school. A beginner can take a trial lesson. Please ask me the term of the trial lesson. 2002 : Launched private lesson studio in Saitama, Japan. 2007 : Established Reon Ensemble which is a style-free association of Japanese traditional music. 2008 : Concert in Vienna Konzerthaus. 2008 : Grandmaster degree of Koto and Shamisen. Entry fee: 2,500yen, just once per person.